Wyndham Street and Bourke Street near Green Square. So let's say you crossed O'Riordan on the side of the street with the walk signal, and you are proceeding up Wyndham. Good luck, though there is a sidewalk, the pedestrian indicator is missing. I am not clear where you are supposed to go, back to Botany Road perhaps? Every signal controlled intersection should have protected pedestrian crossings on every side of every street. Yet this is not the case in much of Sydney. T-intersections often are missing a pedestrian crossing. Not only are marked crosswalks missing, walk signals are missing too, and pedestrians are discouraged from crossing. The reason is presumably convenience for the automobile. These intersection designs increase both the inconvenience to the pedestrian (who must now engage in the double-cross, crossing two street instead of one), and their vulnerability (as the amount of time the pedestrian is crossing a potential car path is greatly increased. 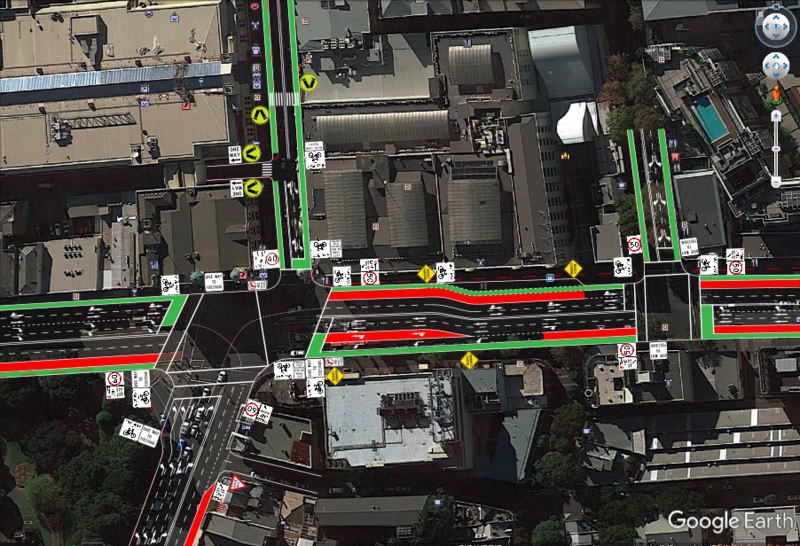 The largest intersection I have encountered where this is an issue is City Road at Broadway. This is technically a 4-way intersection, but it operates much like a T-intersection as the fourth leg is offset and less trafficed. At this site, to get from the east side of City Road (where you start if you are on the Darlington campus of the University of Sydney, 5 minutes of way) to the north side of Broadway (which is a former Department Store that now houses a nice shopping mall) requires crossing both streets (City Road and Broadway) instead of just one (Broadway). And in fact, the pedestrian must face three traffic signals instead of one, due to the pedestrian refuge island in the traffic stream for the convenience of the few City Road motorists traveling west on Broadway/Parramatta Road. At one corner of this intersection is Victoria Park (lower left) and the University of Sydney (just off site), at another is the Broadway Shopping Center. This intersection has a high pedestrian count, high bus count, reasonably high car count, is very wide (befitting the name “Broadway”), and has long delays, especially for pedestrians. The proposed alternative removes the free left turn and porkchop pedestrian island on the southwest corner, gives more space to pedestrians, buses (red), and bicyclists (green), and less space to cars, and the signal retiming reduces total person delay by 1.5% (a lot for pedestrians, while increasing it somewhat for car users), and sends the right incentives. The revised layout is shown in the image. You can download the full report with more graphics, tables, and yes, equations here: broadway-city-road. There are other sites with missing crossings. Mitchell Road and Fountain Street in Alexandria (A T-intersection) comes to mind. The misnamed and malformed Green Square train station has some too. I don’t know of a good tool to catalogue all of these in Sydney, but feel free to leave examples in the comments. Wyndham Street and O’Riordan Street. I can’t cross O’Riordan to get to the Green Square train station, I must cross Wyndham first, and then O’Riordan, waiting for two traffic lights. Cars are not similarly penalized. Is this because cars are more likely to use the train than pedestrians? Wyndham Street and Bourke Street near Green Square. So let’s say you crossed O’Riordan on the side of the street with the walk signal, and you are proceeding up Wyndham. Good luck, though there is a sidewalk, the pedestrian indicator is missing. I am not clear where you are supposed to go, back to Botany Road perhaps? Mitchell Road and Fountain Street in Alexandria. To cross Mitchell, either cross Fountain and then Mitchell, or walk east a block to next intersection, even if it is not where you want to go. Some of this post is adapted from an earlier post on my Transportist blog. Posted in Crosswalks, Refuge Island, Safety, Sydney, Traffic Signals. Bookmark the permalink.